How to use shutter speed to make water more appealing and exciting by capturing movement. Have you ever been to an event with lots of action and wondered how to capture the excitement, energy, and movement of it all? Showing movement or action can be a challenge in photography, but once you know the tricks of the trade, you can create some really unique and interesting photos! That’s exactly what I wanted to do while on vacation with the family in Africa! 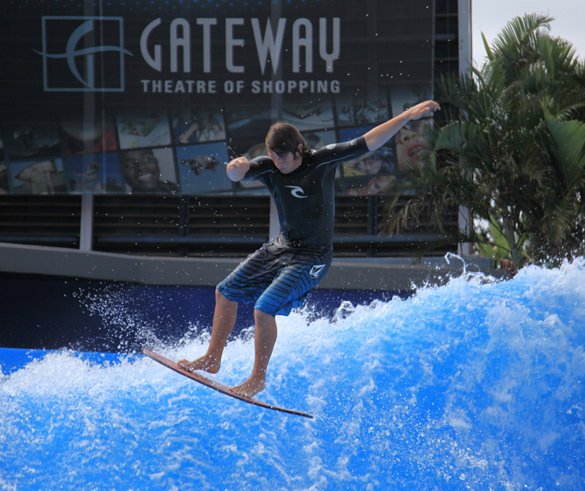 We stopped at a wave-pool to watch these surfers having the time of their lives, riding a standing-wave (a wave that is not moving forwards) and pushing the limits. This gave me the perfect opportunity to capture the thrill of the moment. So, how did I do this? Watch now to find out! Yes! You CAN Freeze Time! There are two main ways to capture movement through photography: You can freeze the action, or you can give the illusion of movement. And both create interesting pictures. In this image, I was able to stop the motion of the wave, freezing it in time, by using a very fast shutter speed of just 1/1250th of a second. You can even see the droplets of water when you zoom in! This is cool, but what I really wanted to show you is the difference between this approach and a slow shutter speed on the exact same scene. By using a slow shutter speed of only 1/15th of a second, I was able to create the illusion of the surfer moving through the wave. Notice the surfer remains reasonably sharp, but you can see the wave curling up around him. The slower the shutter, the more movement you will capture, so you have to experiment to see what works best. I wanted to keep the surfer pretty sharp and tried 1/30th and 1/60th, but 1/15th was best for the effect I was going for. Your shutter speed will determine which effect you get. To show the passage of time (action/motion), use a slow shutter speed. I found 1/15th of a second to be good for this shoot. Both will give you unique pictures. It just depends on the vibe you’re going for. Here are some other pictures I took at the wave pool. Notice how different the feel of each is. Can you tell which is the fast shutter speed and which is the slow? What is the best shutter speed to capture the movement of a model kicking water? Learn how to create extraordinary images that have the “WOW!” factor to take your photos to the next level. Grab the Mastering Shutter Speed Course today! Thank you for sharing this video Brent and thank you for explaining step by step to understand. It’s a great tutorial. Love the way you tell us what shutter speeds were used to achieve this look. Had the opportunity to take a picture of my first waterfall, was at 1/2sec at F14 and I achieved the blurred soft look similar to yours above. Beautiful. Your explanation was clear and concise. Beginners to semi-professionals can gather the difference between slow and fast shutter speed also the gist of whats a shutter. Not only is your professionalism glaring but you ability to TEACH Photography. Well done. 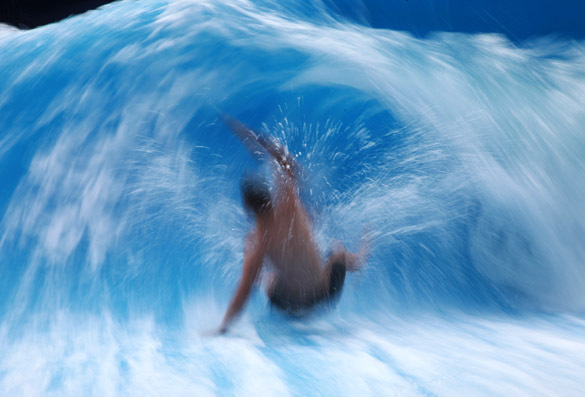 To my surfers eyes the 1250fps shot is full of visual cues of movement. 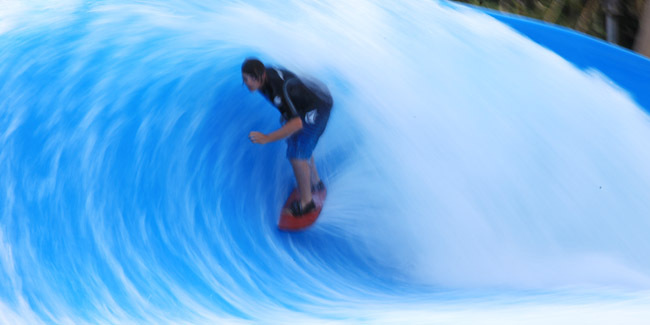 Movement is implicit in a wave and the fact that gravity requires that the rider is moving relative to the water. 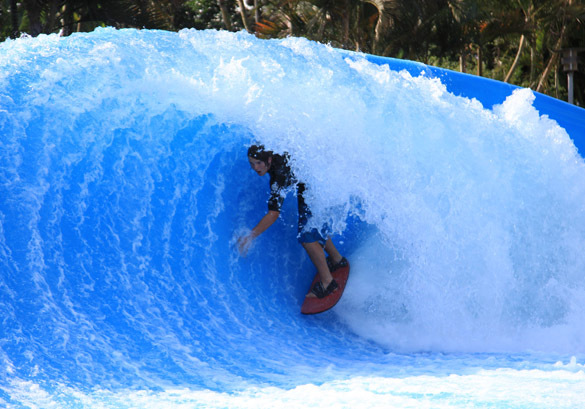 Also the parallel lines of foam running up the face of the wave are obvious visual cues of fast moving water. In the 15fps image the features of the wave have been smoothed so much that it looks like a plastic model, a static object. I guess we all look at world, and images of it, in different ways. I am enjoying this video series. 15fps and 1250fps should have read 1/15th sec and 1/1250th sec. I would love to go on this but my concern is how pricey it might be. I live in Vancouver BC, canada. Would this be for a week ? Maybe you could send some information to me. This would be quite the experience. Great video. Simple and effective. Playing with shutter speed can give great result, but it takes some experimenting to get it right. Brent – THANK YOU !! Finally someone can help me learn the shutter speeds, which (for some reason) I'm having trouble with. I would love to try to go to Africa – but do you have trips inside the USA also ??? Hi Brent, I look forward to getting your tutorials, they are very easy to follow and I learn heaps from them. thumbs up! good examples and explanations.